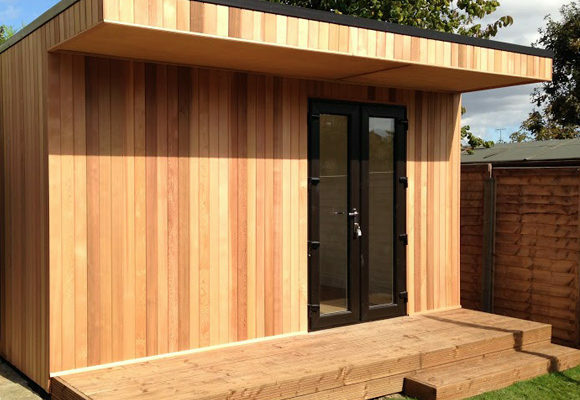 There are so many reasons to build a garden office or garden room for your property. As well as adding extra space, it can provide a quieter space for work or relaxing, or a place further away from the main house to send noisier members of the household! 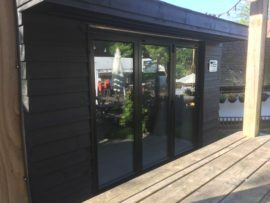 When starting out on a garden office project it is good to think a few things through to ensure that the project runs smoothly and gets off to a flying start. Planning permission is not usually needed for garden rooms. However, there are requirements that need to be considered. We aren’t planning experts so the following is just a guideline. Under the current government rules, a garden office is permitted without planning permission provided it is less than 15 sq m and doesn’t contain sleeping accommodation. If they are between 15-30 sq m, then it will need to be at least a metre from any boundary or built from non-combustible materials. It’s always best to have a site visit with your builder, where any issues like this will be highlighted at the same time as you are having a quote prepared. 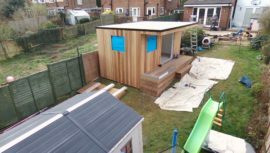 Garden offices can be fitted with electricity and plumbing. This gives you options including bespoke lighting, lighting inside and outside of the garden office, a sink and small space for making refreshments or a toilet. You might also want to consider installing an extra TV/broadband hub in the garden office. This can give you all the tech and entertainment you might need to get your work done. There are a few different things to consider when it comes to the design of your garden room. Garden rooms differ from other outhouses, such as sheds, as they are insulated. This ensures that the room is useful all year round as another room in your house. Without insulation the temperature is difficult to regulate and the room is far more open to the elements. As well as the importance of that atmosphere in the garden room, you also want it to look stunning from outside. There are such a great range of contemporary garden offices available, with designs that can incorporate and enhance the look and feel of your garden. With bifold doors and a range of windows, having a room that opens out into your garden is also a possibility. Doors opening onto decking make a great place to relax in the summer and take in the evening sun with a little refreshment. Whatever you are looking for in a garden room, with careful planning in the initial stages you can easily achieve it.